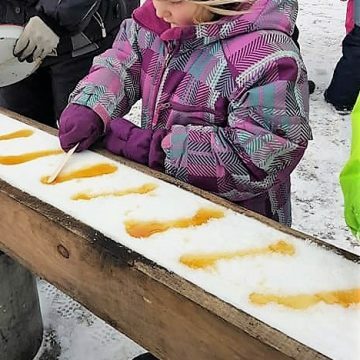 The 1st Lennoxville Beavers Scouts visited the Misty Maples sugar camp in Compton (Quebec) last Sunday. Our visit started with a tour of the farm where we learned how the maple is extracted from the trees and later undergoes a process of concentration. 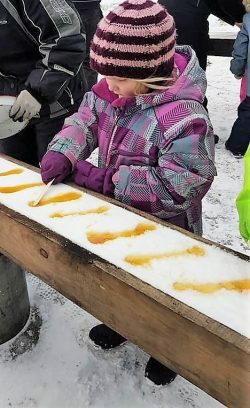 We then proceeded to the sugar-on-snow station for the crafting of our own maple candy. Each member was handed a popsicle stick which we had to twirl in thick, hot syrup poured onto clean snow. 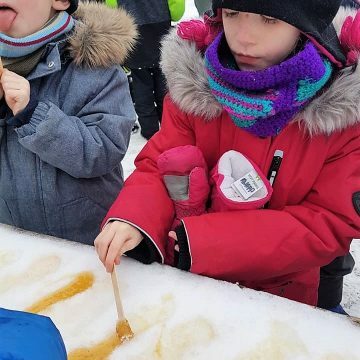 Our young members were surprised and amused by how fast the hot liquid thickened once it came into contact with the snow, and a discussion of the scientific principle behind this phenomenon ensued. Our Beavers greatly enjoyed the exquisite, natural treats. 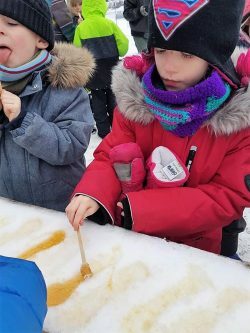 Powered by our handmade delicacies and the abundance of fresh air, the Beavers spent the rest of the afternoon sledding and playing in the snow. What a sweet afternoon it was!